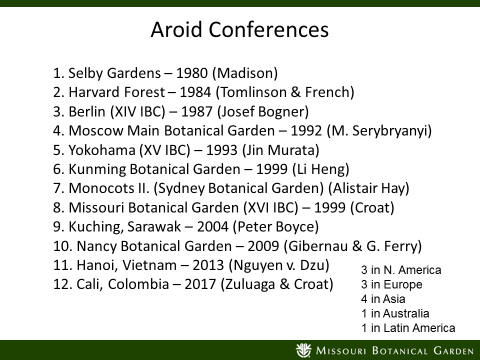 Does anyone have a definitive list of the International Aroid Conferences, including venues and dates? In particular for the Third, Fourth, and Seventh. 7th was Sydney, Sept 28- Oct 2nd 1998. I will keep looking for the others. You should remember that one, Peter, you were there! the Third, Fourth, and Seventh. International Aroid Conferences, including venues and dates? This is great – I was hazy about the Berlin date and had completely forgotten about the Yokohama one. The Kunming Conference was in 1995. I researched this for my review of the History of the IAS. particular for the Third, Fourth, and Seventh.